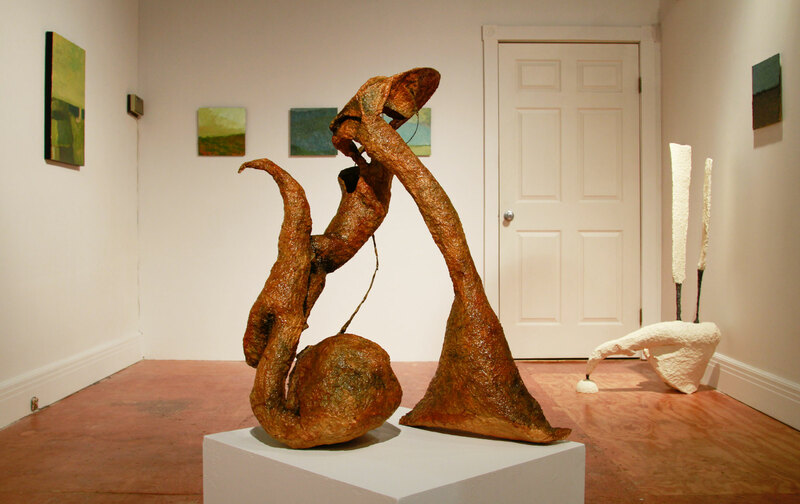 Sculpture by Karen A. Buchner, paintings by Bruce Philip Bitmead at the diminutive Box Gallery on Main Street. The paint looks buttered on. Bruce Philip Bitmead can do this with a brush, but in the eight works on exhibit at the Box Gallery it appears done mostly with a palette knife. In deft strokes, dominantly horizontal and subdominant vertical, resonant analogous with the largely but not thoroughly abstract landscape representational thematic. Landscape and associated geographical and geological elements. Layers that suggest horizons of dissimilar terrain in overview, or alternatively stratigraphic layers, including groundwater aquifers within a stratigraphic complex. In one case an artesian water source welling from underground confinement. Surface waters in river or stream watercourses or lake or ocean bodies. Earth and skies in sensuous blends of subtly modulating tonalities. Greens that mutate to blue, then gray. Blues that intermix a hint of red. Browns from clay to black humus. Aerial view patchwork arrangements of farm fields of different shapes and sizes and crops. Remarkable work in general for the purity of the abstraction and richness of the paint textural and tonal effects. But extrapolating from the titles to the works in general, cricket—the English game no baseball devotee has ever been able to quite fathom—seems to be a subject matter. One piece looks a little like a struck wicket. Another looks a little like two cricket paddles stuck upright in the mud. The media are papier-mâché, styrofoam, wire, and shellac. The dual exhibit continues until October 18. The Box Gallery is at 667 Main Street, next to the Buffalo Niagara Hostel. Part of the hostel, actually. Odd gallery hours, 5-8 pm, Monday through Friday. The hours when someone’s at the desk of the hostel. But worth the effort to get to.